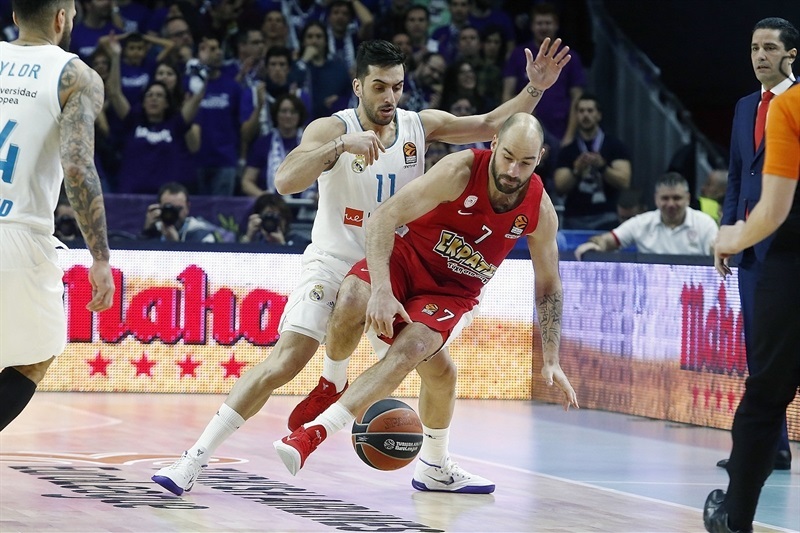 Olympiacos Piraeus sent a message that echoed all around the competition by edging Real Madrid 79-80 in the Spanish capital on Friday. Olympiacos improved to 15-7 and took over second place in the standings due to its 2-0 record against Fenerbahce Dogus Istanbul. Olympiacos is also 2-0 now against Madrid, which dropped to 13-9, tied with Zalgiris Kaunas and Khimki Moscow Region. 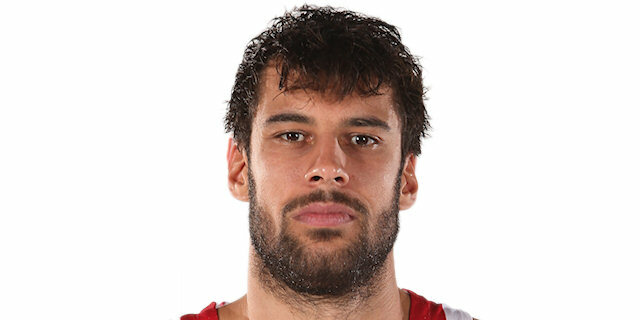 Georgios Printezis led the winners with 21 points. Kyle Wiltjer added 12 and Janis Strelnieks had 11, including the go-ahead free throw with 15 seconds left, while Nikola Milutinov pulled down 12 rebounds. 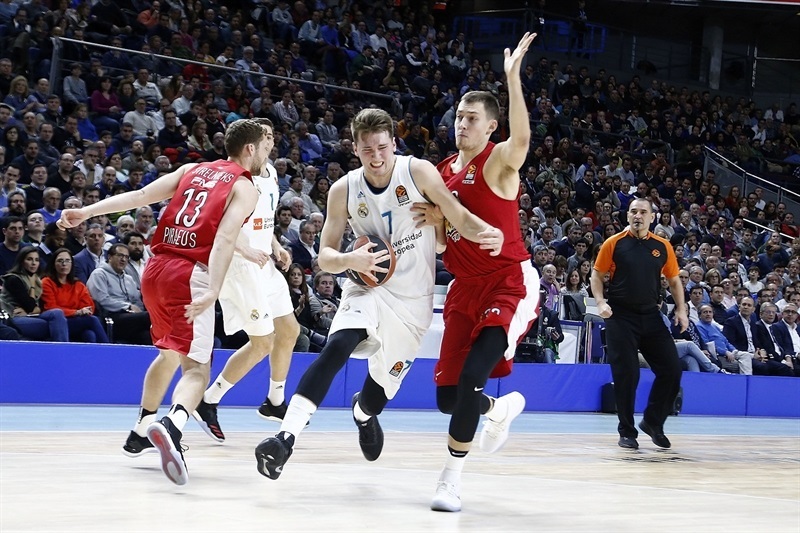 Luka Doncic led Madrid with 27 points and Trey Thompkins added 20 on 5-of-6 three-point shooting. Printezis and Milutinov combined for 13 points in the opening 8 minutes, giving Olympiacos a 20-21 edge after 10 minutes. Olympiacos found new go-to guys in Hollis Thompson and Wiltjer, who boosted the guests' margin to 39-45 at the break. A layup by Walter Tavares tied the game, 49-49, soon after halftime. Kostas Papanikolaou and Printezis rescued Olympiacos and a big three-pointer by Wiltjer kept the guests ahead, 62-65, after 30 minutes. 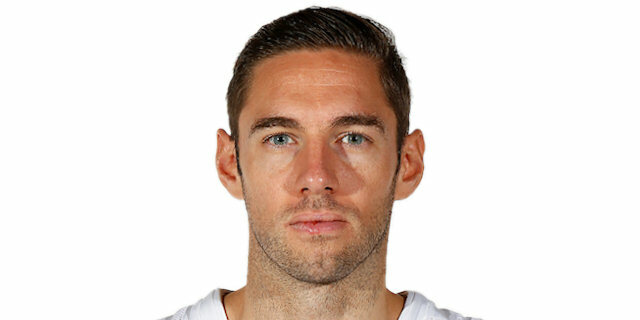 Fabien Causeur had 6 points in a 9-0 run that gave Madrid a 71-65 margin early in the fourth quarter. Printezis rescued his team and a free throw by Strelnieks gave Olympiacos a 79-80 edge with 15 seconds left. 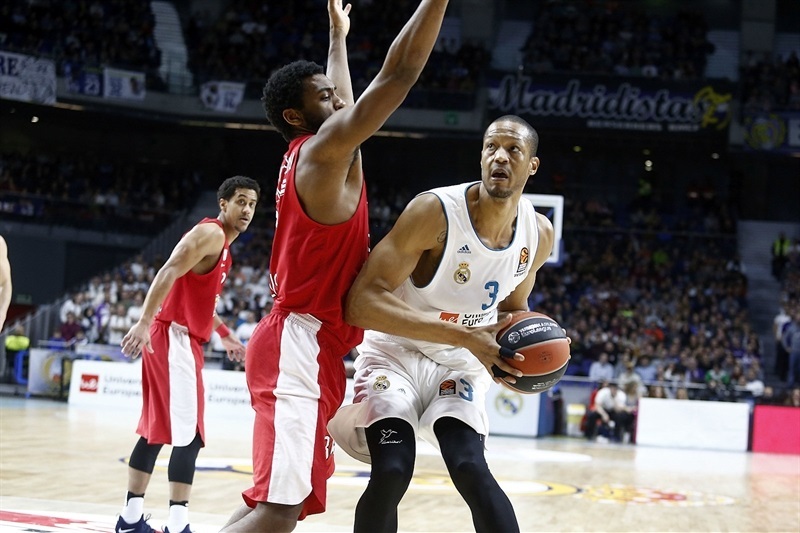 Madrid had a final chance to win the game but could not beat Olympiacos's defense down the stretch. Thompkins got Madrid going with a three-pointer and Doncic added an off-balance jumper but Printezis and Milutinov tied it at 5-5. Doncic hit another jumper but free throws by Milutinov and a layup by Printezis gave Olympiacos its first lead, 7-9. Jeffery Taylor and Thompkins buried back-to-back triples although Milutinov had 4 points in a 0-8 run that restored a 13-17 Olympiacos lead. 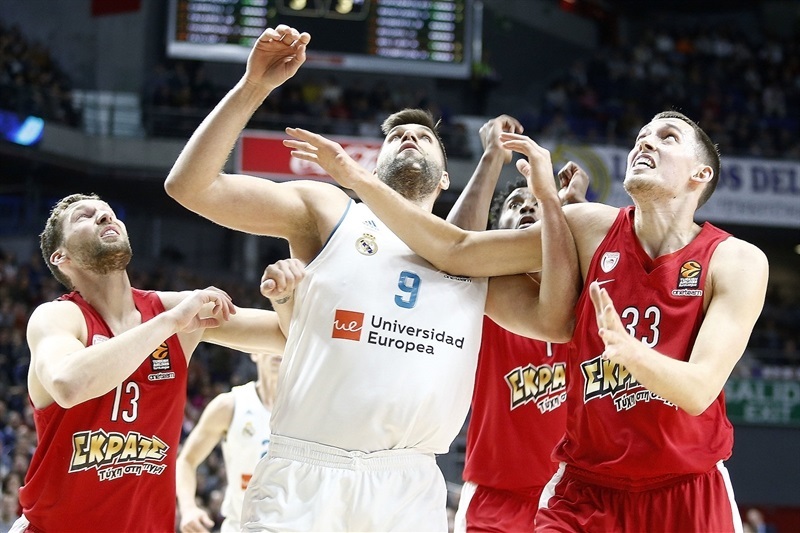 Taylor, Causeur and Doncic made free throws and Anthony Randolph matched Jamel McLean's dunk with a driving layup for Madrid to get within 20-21 after 10 minutes. Thompson hit a floater early in the second quarter, McNeal added a layup-plus-free throw and Wiltjer nailed consecutive three-pointers to boost the Olympiacos lead to 27-32. 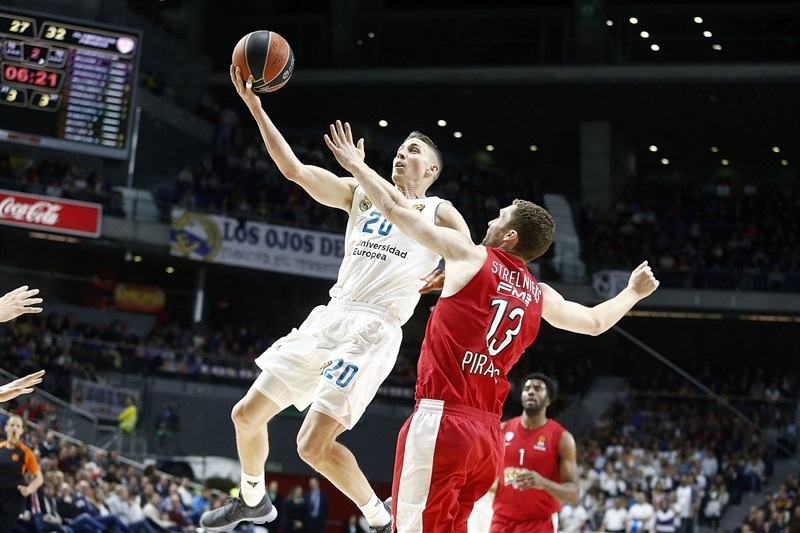 Jaycee Carroll stepped up with a driving layup and Felipe Reyes added a bomb from downtown for Madrid, but Thompson and Strelnieks joined the three-point shootout for a 34-41 margin. Doncic and Carroll each buried jumpers to keep Madrid within 39-45 at halftime. Thompkins hit a three-pointer after the break and Doncic added a layup but Kostas Papanikolaou and Printezis kept Olympiacos in charge, 44-49. Doncic buried one from beyond the arc and Tavares added a layup tied at 49-49. 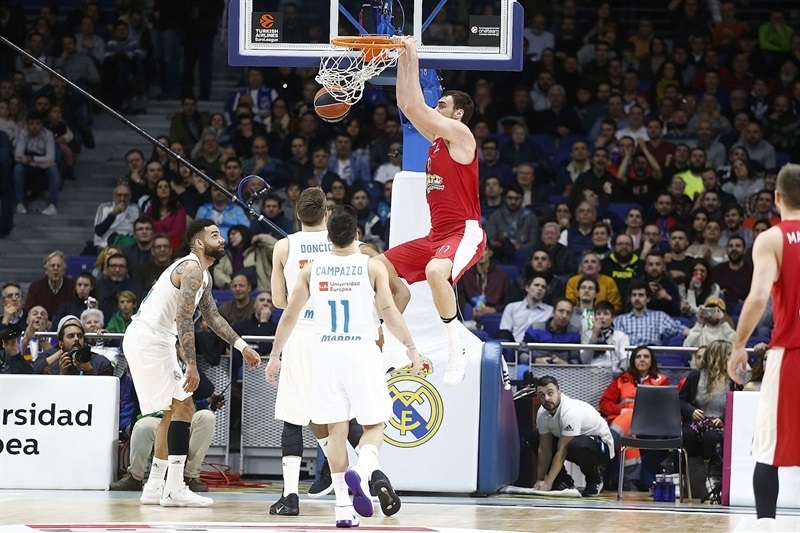 Papanikolaou rescued Olympiacos with a floater and free throws and Brian Roberts hit a triple but an unstoppable Thompkins kept Madrid within 57-58. Strelnieks followed a driving layup with a jumper and Wiltjer beat the third-quarter buzzer with a deep three-pointer to keep Olympiacos in charge, 62-65, after 30 minutes. 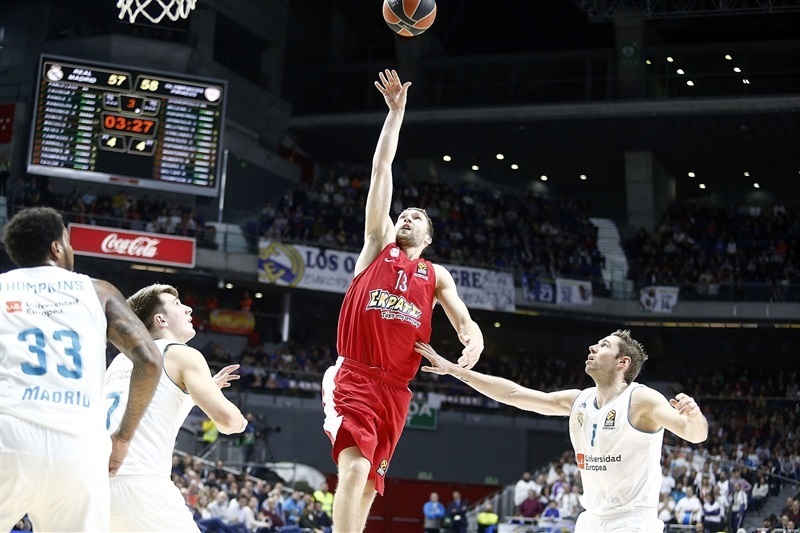 Back-to-back baskets by Causeur completed Madrid's comeback, 66-65, early in the fourth quarter. 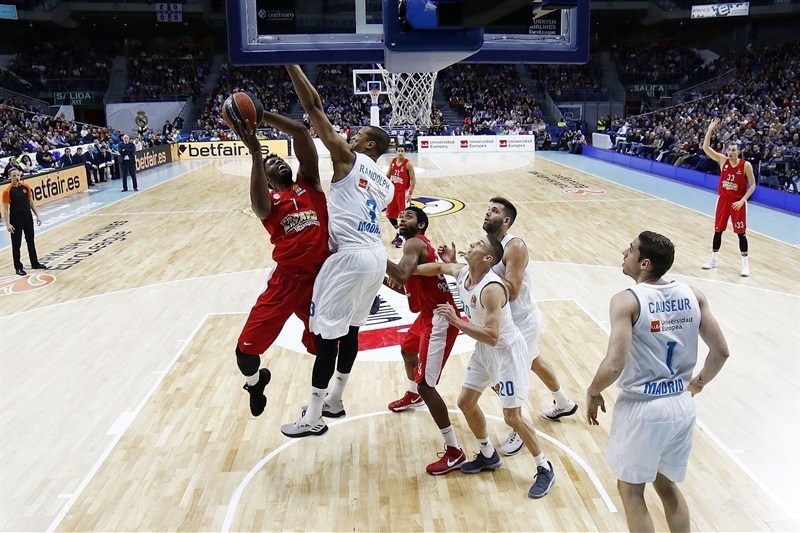 Thompkins downed his fifth triple and Doncic capped a 9-0 run with a floater, good for a 71-65 Madrid lead. 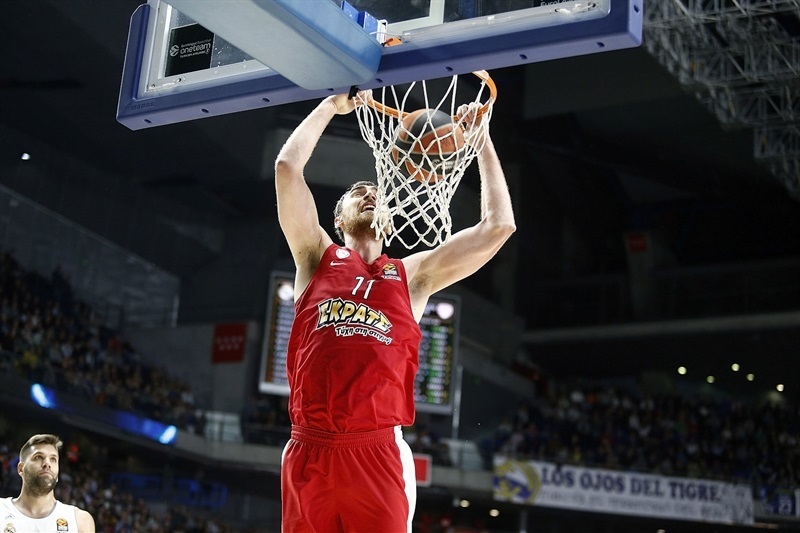 A dunk by Milutinov and a three-point play by Printezis gave Olympiacos hope, 73-70, with more than 4 minutes left. 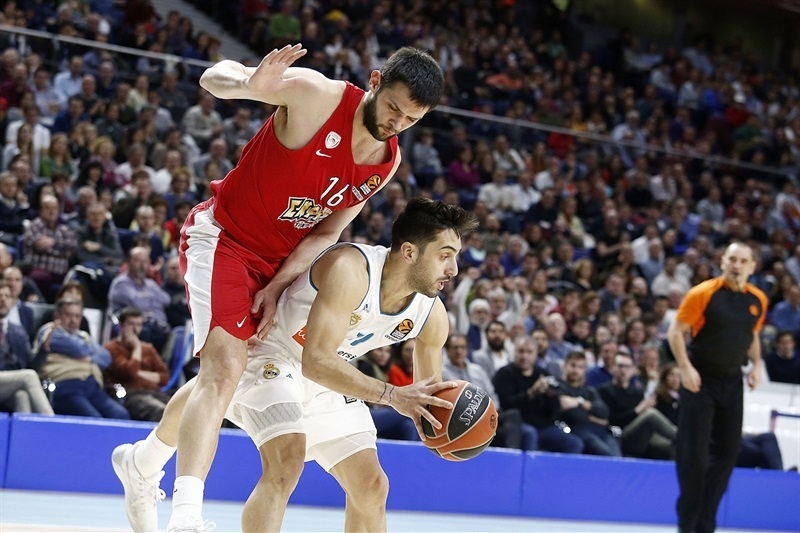 Printezis took over then to put Olympiacos in charge, 75-77, but Doncic drew a couple of fouls and hit 3-of-4 free throws for a 78-77 Madrid lead with 48.4 seconds to go. Strelnieks downed a running shot and traded free throws with Doncic for a 79-80 score with 15 seconds left. 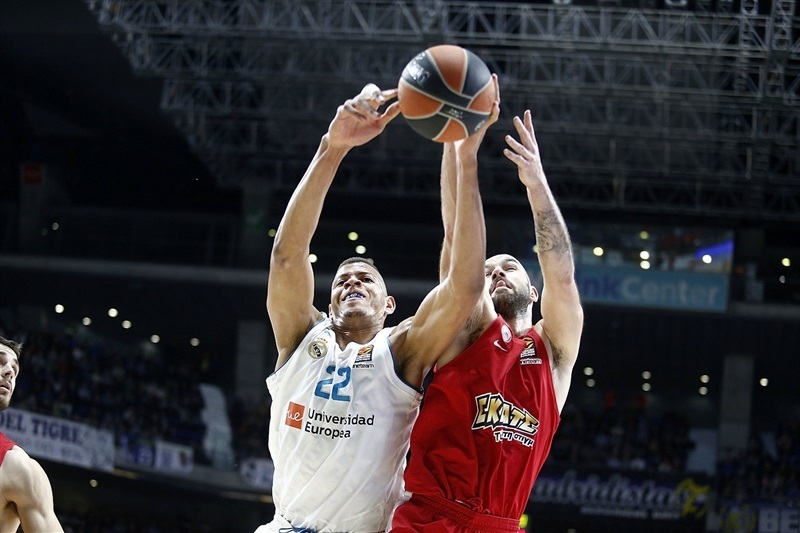 Madrid could not take a shot in the game's final possession so the valuable victory went back to Piraeus with Olympiacos. Both teams return to Turkish Airlines EuroLeague action in two weeks' time. 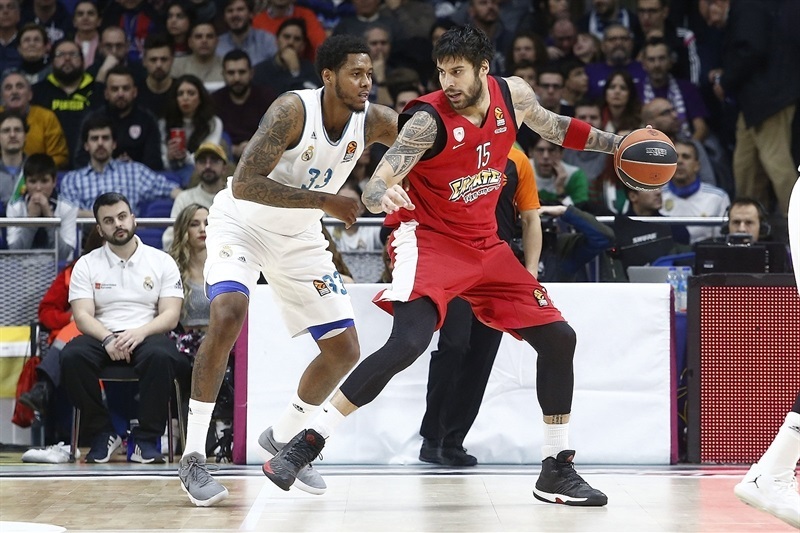 Olympiacos hosts Valencia Basket on Thursday, February 22 and Madrid visits FC Barcelona Lassa in El Clasico a day later. 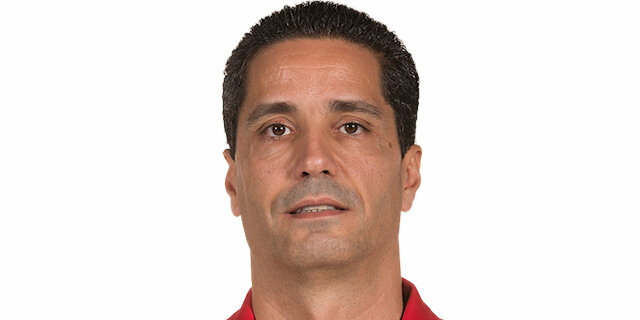 "First, congratulations to Olympiacos for the win. I think it was a game in which we played three quarters very good – the first, third and fourth. The second was very bad and the difference could have been bigger, because we had no control of the pace of the game at that moment. In the second half, we were able to turn it around and even were ahead against a team that we know they play until the final seconds, as they did today. In the end, what probable made you win or lose, when you look at the stats, there is something that punished us a lot, which was 10 missed free throws. Those 10 free throws could be decisive, especially when you lose; when you win, you think about it less. We did many good things to be in the game but in the end, Olympiacos played until the last second and I want to congratulate them. We have to move on after this loss, which happened in the last seconds and makes it more painful." "It is a very important win for us because when you play against Real Madrid in their home court, it is not easy to win the game, especially when we know we are fighting for the playoffs and Madrid has big possibilities to go to the Final Four. It is one of the favorites and this is a very important win. I want to congratulate the players for this win. About the game, I think our players controlled the game with good defense. 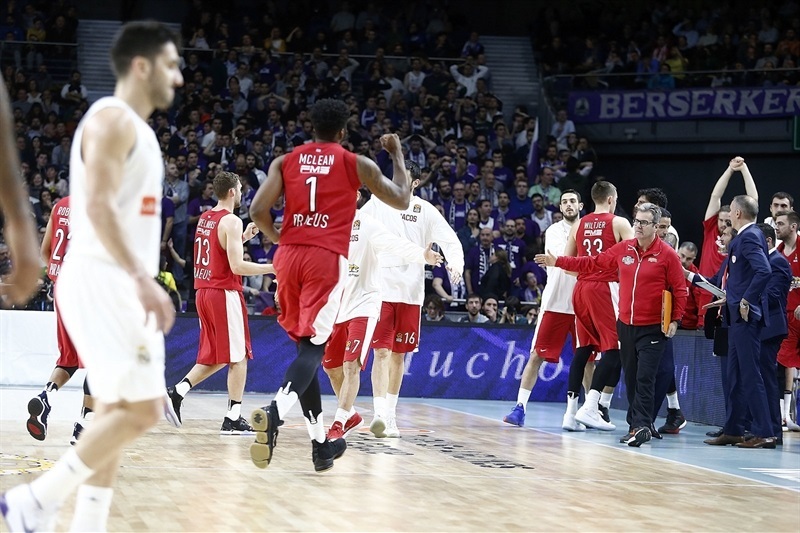 In general, with our good defense, we managed to disorganize Madrid's game, and most important, their up-tempo game, running their fast breaks and the easy baskets they score. Keeping Real Madrid to low scoring gave us chances to win the game and this is what happened. Of course, although in the first half we controlled the game for the whole 20 minutes, I think that in the second half we expected Madrid to react and it was very important, I think, at 5:44 before the end, when Madrid got a six-point lead, that we didn't give up and continued to fight. We came back to the game and in the end, we played two or three good defenses and won the game. Congratulations to all the players. We continue and it is a long way to go. We have a lot of games until the end of the season and need to continue humble, fighting, because anything can happen for good or bad. I want to wish Madrid and my good friend Pablo Laso good luck in the upcoming games." "This is a very painful loss. We lost the game due to our own mistakes and I feel particularly guilty because of that stupid technical foul. It was completely unwanted, but it was a technical foul and that's it. We now have to think about the next game. It was an important game for us that slipped away because of our mistakes. We have to think of the next game, try to stay in the top four, and get road wins, because when you lose at home, you have to bounce back on the road. It was not my intention to kick the ball so far away, but in the end, the referees called the technical foul and that's it." "It hurts a lot because I think we played a good game but lost due to small details like free throws, important rebounds. We were really close to winning it. 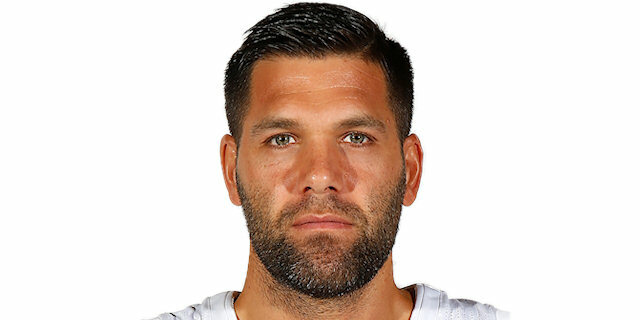 They scored 24 points in the second quarter. We didn't have problems to score, had 40 points in the first half, but I think we improved our intensity in the second half. We got a six-point lead and a chance to go up by eight or 10 points, which would have been important, but didn't do it. Olympiacos has been winning games like this for years. We knew that before the game and it hurts, but it is not the end of the season. It was a tough game but we have to think of the next one. We still can get the home-court advantage in the playoffs. We have to win at home against direct opponents like Fenerbahce and Panathinaikos. We also have to go to Barcelona to play against them. All of those are very important games that can give you the home-court advantage, which is always important to make it to the Final Four. We have to learn from today's mistakes and keep getting better." "It is a very important win for us in a very difficult game. In the last games, especially away, we didn't play as we can play. We really wanted this win and everybody knows it is very difficult to play here. They are a very good team, a very talented team. Congratulations to my team because we played really well. EuroLeague is like that: we can beat all teams but also lose against all teams if we are not concentrated. We saw this many times. We played our last road games against Baskonia and lost easy, we also lost against Khimki and Crvena Zvezda, then we came here and beat Real Madrid. Let's say they are the best team, but you never know. I believe it depends on us. When we play like this, with heart, even if we lose, we know that we give our best for the game, and this is most important as Olympiacos."